AW=Aruba ES=Spain IT=Italy SK=Slovak Rep.
CH=Switzerland GR=Greece NO=Norway UK=United Kgd. CZ=Czech Rep. HR=Croatia PL=Poland US=Un. St. Am. :x+/y = number of positive observations/total number of observations. When details are lacking, the duration accuracy is usually rms computed. BBC = British Broadcasting Company radio time signals. Observatory = "rutinary time in the observatory"
E, N, S, W = East, North, South, West. NOTE : When an observation was made by several observers, they have been usually listed in alphabetic order. from UT 04 33 05 to 04 33 09.5, and another blink at UT 04 36 29 . "Short blink around UTC 04h 35m"
objects merged from UT 18 33 20 on. 23 31 > 23 39 L 300mm ? , ? NOTE. At the same place as J. M. Winkel, did not see occultation probably due to lack of experience (1st attempt of observation). PE subtracted 2.0s at disappearance and 0.5s at reappearance. 23 34 06.2 ±?s > 23 34 10.0 ±?s duration 3.8s ±? Unspecified PE subtracted at both disappearance and reappearance. Fast imaging mode, 1.00s exposures + 0.35s lapse (530/900nm filter). Fast imaging mode, 0.30s exposures + 0.35s lapse (>700nm filter). "(31) passed <0.5" north of the target." Fast imaging mode, 0.25s exposures + 0.49s lapse (red filter). Fast imaging mode, 0.20s exposures + 0.163s lapse (no filter). Fast imaging mode, 0.10s exposures + 0.163s lapse (no filter). NOTE: result in close agreement with R. Casas observation. The observed chord was near the southern limb. Pic-du-Midi missed the northern limb by 115km, assuming a 44km diameter. All error bars 2sd. 01 10 15.4 ±?s > 01 10 17.8 ±?s duration 2.4s ±? 00 55 25.6 ±? > 00 55 28.6 ±?s duration 3.0s ±? 00 55 36.3 ±? > 00 55 37.0 ±?s duration 0.7s ±? Double occultation. 0.3s PE subtracted at all events. Seeing : Clear, slightly hazy, some cirrus (? ), fair stability. ?? > ?? M 200mm ? , ? Unspecified PE subtracted at all events. A thin cloud probably passed over that place from UT 22 53 53.6 on. The flux ratio A/B seems to be around 1.4. "Slow disappearance for about 1 second"
22 53 56.3 ±1s 1st step disappearance duration 2.2s ±? 22 53 58.5 ±1s > 22 54 02.2 ±1s duration 3.7s ±? 0.4s PE subtracted at both D and R.
Fluctuating mag during 1st step, a flash just before 2nd D.
NOTE: Triple negative observation at Diotima south edge. ?? > ?? M 225mm ? , ? ?? > ?? ? ?mm ? , ? 22 40 > 22 57 M 210mm ? , ? Note: clouds prevented to resume CCD imaging after appulse. PE subtracted 0.50s at D and 0.35s at R . Two steps disappearance was NOT noticed, "perhaps that this step was too short (< 1 second) at my observation place. Reappearance was sharper than disappearance"
PE subtracted 0.40s at D and 0.25s at R. "Fast reappearance (< 0.1s)"
?? > ?? ? mm ? , ? 22 53 35.0 ±?s > 22 53 43.4 ±?s duration 8.40s ±? Note : TWO distinct 16" scopes at the same location ! 22 53 30.0 ±?s > ?? ?? > ?? M 203mm ? , ? "Steps at intermediate and stable level. Asteroid was visible during the occultation of star. Is HIP 664465 a double star ?" PE subtracted : 0.5s at 1st step disappearance, 0.25s at other events. 22 49 > 22 59 M 200mm ? , ? 22 51 26 ±1s > 22 51 40 ±1s duration 14s ±? 22 42 48.55 ±?s > 22 43 04.95 ±0.05s duration 16.4s ±? As published by David Dunham, 2002 February 8. 22 42 45.09 ±1.4s > 22 43 01.24 ±1.4s duration 16.15s ±? average separation between 1st & 2nd events duration 2.8s? ±? (As published by David Dunham, 2002 February 8). 22 42 45.1 ±0.1s > 22 43 01.24 ±0.01s duration 16.64s±0.1? (As published by Dave Herald in Winoccult file). 22 41 59.2 ±0.5s > 22 42 16.0 ±0.5s duration 16.8s ±1? (As published in Bull.Astr.Soc.India (2001)29 p.581). No mention of PE subtracted. No mention of correction from the GPS display, which is usually ~0.4s late and sometimes up to 3s. The scope used is the guide telescope of the main 1.02m one. Due to strong noise, the 2nd emersion is not as accurate as the 1st. As published by David Dunham, 2002 February 8. It looks like if some wild arbitrary correction (of a full minute) had been made, otherwise the original timings first published would be irreconciliable with other observations. "(31) passed north from the target"
"(71) passed 1.5" south-west from the target"
At UT01 43 ++, objects were merged at 157x magnification. Note : 6 observers at the same place, Marcin KRAWCZYK being also there. 22 15 > 22 35 M 305mm ? , ? "blinks at 01h 20:40 and 23:35 due to atmospheric unsteadyness"
3 seconds dimming of the star UT00h 15:40/43 . Slowly dimming again, starting at UT00h 15:47 ; 5s complete disappearance UT00h 15:53/58 ; 4s gradual reappearance from 15:58 to 16:02. The observer thinks that all that is an artefact. ?? > ?? M 206mm ? , ? Fast imaging mode, 0.20s exposures + 0.245s lapse (red filter). NOTE: Hesburgh passed south of Spain near Gibraltar. Initial computation by Jerome Berthier (Annuaire du Bureau des Longitudes 2001)gave a track from Valencia (Spain) to south Portugal. PE 0.39s subtracted at both disappearance and reappearance. 01 06 02.0 ±? s > 01 06 03.0 ±? s duration 1.0s ±? ?? > ?? L 133mm ? , ? (712) passed SSW of the star. This occultation was last minute predicted by Jean Lecacheux, to happen around UT 01h34. "Appulse about 40 to 50s earlier than the predicted time"
Lecacheux thinks that the first "event" could be spurious, due to eye tiredness. The second "event" seemed real, with instantaneous disappearance and reappearance, and the brightness of the nearby comparison star GSC 2439 1091 (mv=10.4) seemed unchanged ; but this "event" arised some 5 minutes after the predicted appulse. before UT 03h16m and from 03h24m ahead"
(5 around UT 03h and 5 around UT 03h30). "Appulse about 25s earlier than the predicted time"
22 10 > 22 20 L 300mm ? , ? Cloud interruption UT 02h 48:00/07 , and from 02h51:05 on. "Ended by dew deposit on the eyepiece." 23 27 11.4 ±?s > 23 27 14.0 ±?s duration 2.6s ±? 23 10 > 23 41 30 M 150mm ? , ? and at 14.3km ESE from Manek's one"
?? ±?s > ?? ±?s duration > 6s ±? ?? > ?? M 250mm ? , ? PE estimated at 0.4s +.2/-.1 , 0.4s subtracted at both D and R.
"Tiny blinks at UT 04h 19:42.2 and 24:02.8 (less than 0.4s) probably due to local atmospheric turbulence". 04 11 > 04 35 M 250mm ? , ? "Possible blink at 04 16 17.9, but very uncertain"
17 59 30 > 18 05 00 L 300mm ? , ? with a 0.4s PE (accuracy ±0.25) subtracted. "The possible disappearance looked like a real event but occurred just as clouds were returning. I suspected reappearance through a brief semi-transparence of clouds near 02h 50:55.0/55.5 , but this R-event is highly more uncertain than the D-event. My observing site was at 4.5km N from the computed central line, the appulse was expected at 02:51:09.5, according to Preston's update." Note: this astrometry is not in very good agreement with observed chords. PE subtracted 1.3s at disappearance, 0.3s at reappearance. Note : the occultation probably occurred during the 2nd interruption. 02 45 > 02 55 L 127mm ? , ? 23 31 51.4 ±?s > 23 31 52.8 ±?s duration 1.4s ±? (taken in the night from October 24th/25th, evening of 25th cloudy). "Brief scintillation at UT 21 51 28.3 ±0.3s"
"(89) passed about 1"/2" south from the target"
"The couple asteroid + target star was easily resolved at any time during the appulse : closest distance ~7" (rough estimation). There is clearly a problem with the star declinatio in the source catalogue (ACT, +40d 29' 17.2") when the GSC declination seems to be correct (40d 29' 12.7")"
Note : this possible secondary event had not been predicted in advance. "The star appeared to be 0.3 mag fainter than (36) and 0.3 mag brighter than TYC 2833 00974 1. The couple asteroid + target star was easily resolved at any time during the appulse : closest distance was 2.5" to 3" to the NNE. Time of closest approach was about UT 05 24 41 (visual estimation). The path of shadow was thus tangent to the terrestrial globe or just missed it." "Magnitude of (393) V = 13.4 (by comparison with nearby GSC stars)"
20 56 > 21 17 M 250mm ? , ? "Occultation predicted by Jerome BERTHIER at IMCCE, “Ephemerides Astronomiques 2001” pp.309-310 & 315; closest approach near UT 02 07"
"Stopwatch did not work properly, and there was no tape recorder backup"
0.3s PE subtracted at both events. Note : (1647) Menelaus is a Trojan asteroid. 20 31 > 20 42 M 254mm ? , ? Fast imaging mode, 0.050s exposures + 0.167s lapse (no filter). Beamsplitting 30% of the target light to a guider camera. "(168) passed about 1" south from the target"
"Occultation predicted by Jerome BERTHIER at IMCCE, “Ephemerides Astronomiques 2001” pp. 309-310 & 316 ; updated by Steve Preston, the closest approach should have been from Paris near UT 21 20"
"From UT 21 27 55 to 21 28 27 I did experiments with the retinal blind spot of my eye. When I looked at a nearby star lying on the left margin of the field, I was able to switch the target star off. I did that several times and I enjoyed a full control : the apparent extinction saw perfect every time, and I obtained any desired duration. Clearly uncontrolled tilts of our vision axis due to tiredness are able to briefly put target stars on our retinal blind spot, and are possible of false secondary occultations." ?? > 21 52 29.7 ±? duration ? Disappearance missed due to clouds. PE 0.4s subtracted at reappearance. NO delay time subtracted from above values. "Station at 8 km NNW from the Preston's predicted central line. From UT 21 51 03 to 21 51 21, obvious weakening of the target suggesting occultation of an unknown companion of the star. Local turbulence might have produced this transient weakening." Fading from UT 22 00 30 to 22 00 38 from an unknown cause. 21 40 > ?? ? ?mm ? , ? "Almost the same experience as Lecacheux's : just before the predicted time the star was at the limit of visibility. One minute later it was seen without difficulty." Note: I. and L. Blommers used a refractor and its guide, hence on the same mount. The error bars are coherent. 0.01" in latitude is about 0.3m . "Station a few kms south from the Preston's predicted central line." 21 51 30 ±?s > 21 51 42 ±?s duration 12s ±? 21 51 34 ±?s > 21 51 42 ±?s duration 8s ±? Note: R. J. Bouma and E. van Dijk were at the same location, each with his own Newtonian telescope and stopwatch. They have no explanation for the stunning difference in disappearance time. PE subtracted 0.4s at D and 0.3s at R. Station at predicted north limit. "Power failure from UT 21 50 to 21 53 prevented observation." 00 20 > 00 30 M 203mm ? , ? 00 26 34.0 ±4s?? > 00 26 38 ±4s?? duration 4s ±? Times and duration estimated "some 10 seconds later". "Asteroid ~1mag brighter than the star, the target redder than (712). 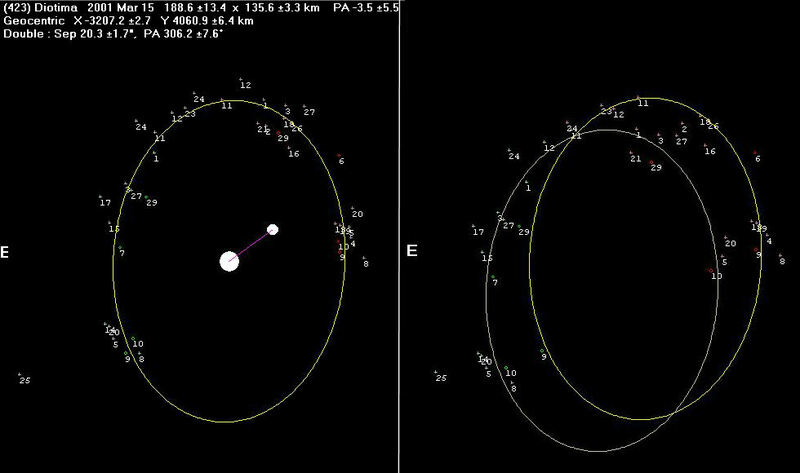 Such occultations of ~0.4 mag could be monitored with a 1 meter telescope successfully, but only in very steady conditions." From a mail on "AUDE" list. The mail gives a 177m altitude. 21 56 45.0 ±1s > 21 56 51.0 ±1s duration 5.9s ±? Unspecified PE subtracted from above timings. (569) seen during the occultation. Nearby ~12mag control star steadily visible. 17 59 20.2 ±?s > 17 59 25.3 ±?s duration 5.1s ±? PE subtracted 0.4s at D, 0.2s at R. "(144) remained visible"
18 00 00.0 ±?s > 18 00 00.5 ±?s duration 0.5s ±? Possibly dubious (a thin cloud was passing). No PE subtracted. 01 09 42.0 ±?s > 01 09 43.0 ±?s duration 1s ±? 17 59 30 > 18 05 00 L 200mm ? , ? Special thanks to Jean Schwaenen who helped me constantly.